Painter, draughtsman and printmaker. He studied first in Siena with his stepfather Arcangelo Salimbeni, and then in Rome (1579-80) with Giovanni de Vecchi. The stylistic sources of his earliest works, such as the Baptism of Constantine (1586-87, Siena, S Agostino), lie both in the art of Salimbeni, which represented a reaction against the artificiality of Mannerism, and in the art of the Counter-Reformation in Rome, particularly that of Federico Zuccaro. From 1585 the strongest influence on his work is the art of Federico Barocci. This is particularly evident in the sharp and acid colours, rich in clear and iridescent tones, of Christ Appearing to St Catherine (Siena, Santuario Cateriniano) and of the Baptism (1587, ex-S Giovannino e Gennaro, Siena). It is also evident in his handling of facial types in the Immaculate Conception (1588; Montalcino Cathedral) and still more marked in the Annunciation (1589; Siena, S Maria dei Servi), commissioned by the Servi Order in Siena, which is directly based on Barocci s Annunciation (Rome, Pinacoteca Vaticana). Vanni also responded to the art of the Carracci, which he may have assimilated during a probable apprenticeship with Bartolomeo Passerotti in Bologna, or while on a visit to that city. St Francis Receiving the Child from the Virgin (Florence, Uffizi) has long been attributed to Ludovico Carracci but is in fact the bozzetto for Vanni s St Anthony Receiving the Child from the Virgin (Amsterdam, Rijksmuseum). His son Raffaele Vanni (1587-1673) was also a painter. 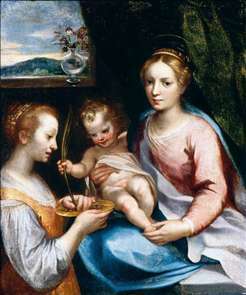 See more details about "Madonna and Child with St Lucy"